the Sacrament of the Sick, and Holy Orders. all who are anointed with it in preparation for their baptism. Bring them to a deeper undertanding of the gospel, help them to accept the challenge of Christian living, and lead them to the joy of new birth in the family of your Church. Lord God, loving Father, you bring healing to the sick through your Son Jesus Christ. upon this oil, which nature has provided to serve the needs of man. May your blessing come upon all who are anointed with this oil, that they may be freed from pain and illness and made well again in body, mind, and soul. 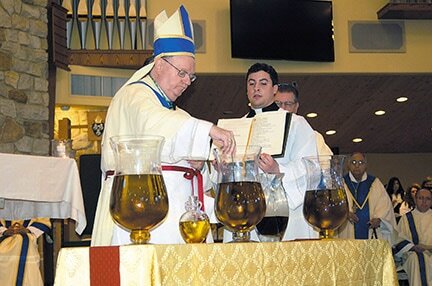 The bishop pours the balsam or perfume in the oil and mixes the chrism in silence..after this he signs the invitation: Let us pray that God our almighty Father will bless this oil so that all who are anointed with it may be inwardly transformed and come to share in eternal salvation. God our maker, source of all growth in holiness, accept the joyful thanks and praise we offer in the name of your Church. In the beginning, at your command, the earth produced fruit-bearing trees. From the fruit of the olive tree you have provided us with oil for holy chrism. The prophet David sang of the life and joy that t he oil would bring us in the sacraments of your love. After the avenging flood, the dove returning to Noah with an olive branch announced your gift of peace. This was a sign of a greater gift to come. Now the waters of baptisn wash away the sins of men, and by the anointing with olive oil you make us radiant with your joy. At your command, Aaron was washed with water, and your servant Moses, his brother, anointed him priest. This too foreshadowed greater things to come. After your Son, Jesus Christ our Lord, asked John for baptism in the waters of Jordan, you sent the Spirit upon him in the form of a dove and by the witness of your own voice you declared him to be your only, well-beloved Son. In this you clearly fulfilled the prophecy of David, that Christ would be anointed with the oil of gladness beyond his fellow men. And so, Father, we ask you to bless this oil you have created. Fill it with the power of your Holy Spirit through Christ your Son. It is from him that chrism takes its name and with chrism you have anointed for yourself priests and kings, prophets and martyrs. Make this chrism a sign of life and salvation for those who are to be born again in the waters of baptism. Wash away the evil they have inherited from sinful Adam, and when they are anointed with this holy oil make them temples of your glory, radiant with the goodness of life that has come in you. Through this sign of chrism grant them royal, priestly, and prophetic honor, and clothe them with incorruption. Let this be indeed the christ of salvation for those who will be born again of water and the Holy Spirit. May they come to share eternal life in the glory of your kingdom. We ask this through Christ our Lord. Amen.